This upside down beer bottle suspended in a glass is fun, plain and simple. 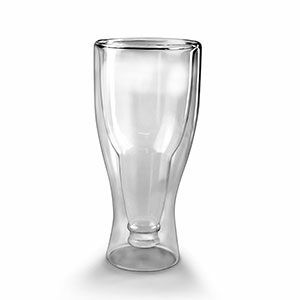 We love the design and solid construction, which enables condensation-free drinking and keeps the beer cold (insulated design prevents the beer drinker's hands from warming the beer). We also love the ability to monogram it (only at GiftTree). Buy a set of four or six and make your favorite beer lover's day.